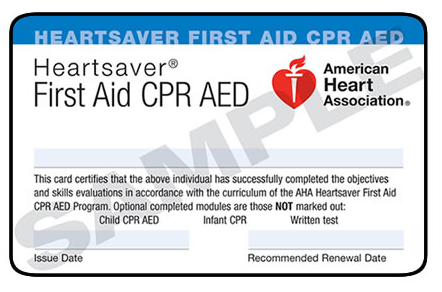 The American Heart Association Heartsaver First Aid CPR AED course provides basic first aid and safety skills, equipping individuals to recognize and provide basic first aid care for injuries and sudden illnesses. You’ll learn how to identify and care for a variety of medical emergencies, including severe bleeding, shock, musculoskeletal injuries and other sudden illnesses. You will also learn to provide care for choking emergencies and perform CPR and use an AED device for victims of sudden cardiac arrest of all ages. This course is recommended for Massage Therapists, Teachers, Coaches, Parents, Day Care Providers, Construction workers, and anyone who wants to learn basic First Aid and CPR and does not work in the Medical Field. Do you need to take a CPR AED class on a date that is not listed on our schedule? Contact us and we’ll work something out.